Training Day Gym Clayton & Burwood —Can't Feel Your Glutes & Lats? You may have weakness in your Posterior Oblique Sling. Your Posterior Oblique Sling is the fascial connection between your Latissimus Dorsi, Thoracolumbar Fascia, Contralateral Glute Max and Glute Med. Strength and balance in the posterior oblique sling is typically assessed when looking at walking, running and sprinting mechanics. However it also plays a crucial role in many of the lifts that we perform in the gym such as deadlifts and squats. Weakness in this sling will compromise the ability to perform these exercises correctly due to the inability contract the right muscles. if we cannot maximally contract the right muscles, i.e Lats and Glutes, energy will be leaked and the ability to produce force will be compromised. 1. Split Stance, Single Arm, Straight Arm Lat Pull Down with Lateral Flexion. 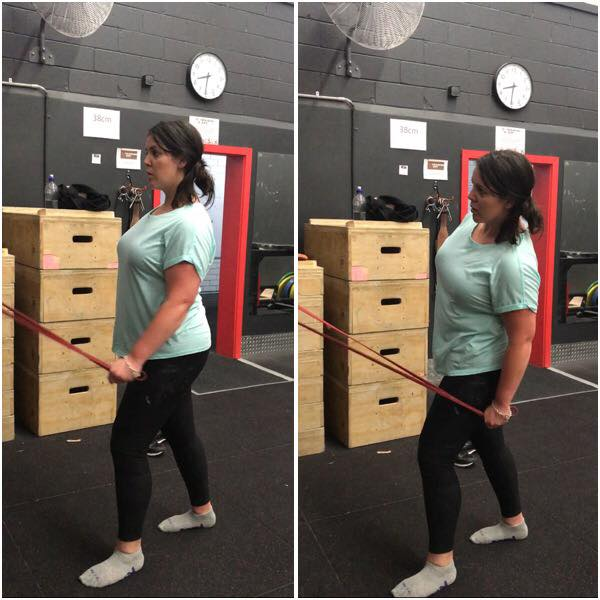 This exercise puts the Lat In it’s shortest position so it can contract maximally. 2. Single Leg, Single Arm OverHead Press with a Psoas Lift. This exercise activates all the muscles in the posterior oblique sling, starting from a nice arch in the foot, to the glute max + med, to the opposing Lat. We then retested her paused deadlift. She said she could feel her Lats and Glutes contract, the weight felt super light and that it was the best her deadlift had ever felt.